As I’ve put myself on a limited work schedule owing to a routine medical procedure (which has been already carried out), I’m recusing myself this week from a post. One correction, however: I had replied to commenter Doug Glancy (The Camera Tool, Part 1 post) that the Camera button has been installed as a default on the Quick Access Toolbar in the Excel 2013 beta. That isn’t true. The recommendations may range from inspiring to clunky, and won’t absolve you of the mandate to learn pivot tables, though. I wondered about that, and figured I just had a faulty beta :). 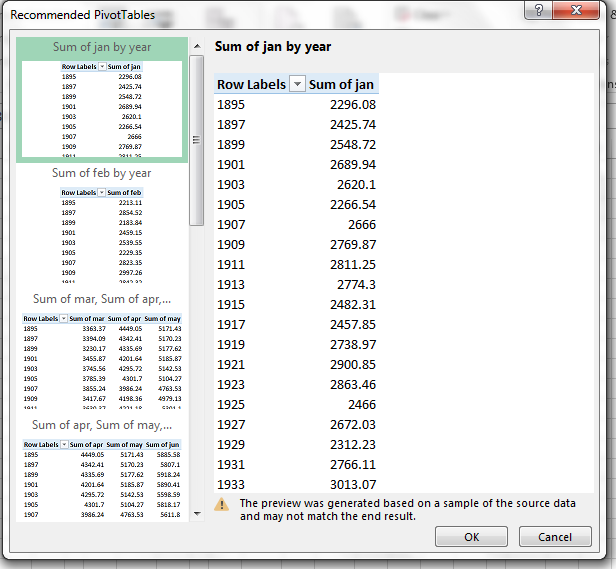 I actually just did a post on my blog about pivot tables and my alternative to the various built-in formatting options. It sounds like 2013 takes built-in formatting a step further. I’ll have to check it out. I’m interested in an example of an inspiring recommendation. Thanks for the wish – I am feeling much better. I was being slightly ironic about Excel’s inspired input, but to be fair I haven’t gotten into that side of 2013, along with its built-in formatting improvements (of which I haven’t seen any evidence yet – but I defer you on this point).